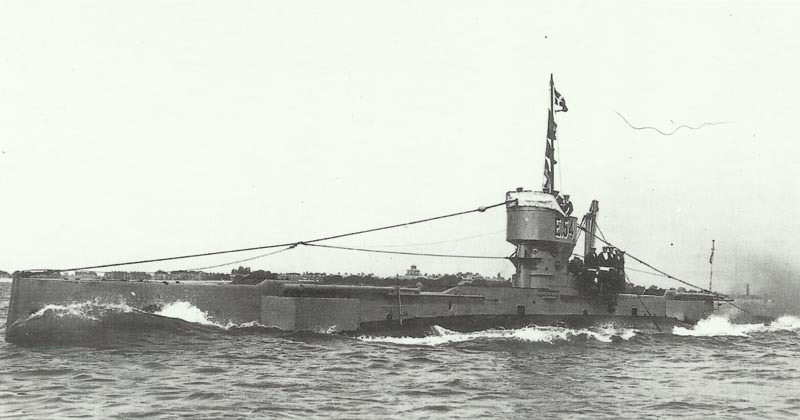 The British submarine E54 running on high speed. North Sea: Royal Navy submarine E54 torpedoes and sinks German mine-laying sub UC10 at Schouwen Bank. Battle of the Somme: Fresh German counter-attack near Thiepval (2 more to south fail on August 22). Fighting south of Thiepval ends in slight British gain (August 23). British advance on 1/2-mile front northwest of Pozieres. Salonika: British raiders (4 casualties) blow up 5 bridges east of river Struma (and on August 23). Britain: Almost all exports to Sweden prohibited. Directorate of Graves Registration and Enquiries formed.